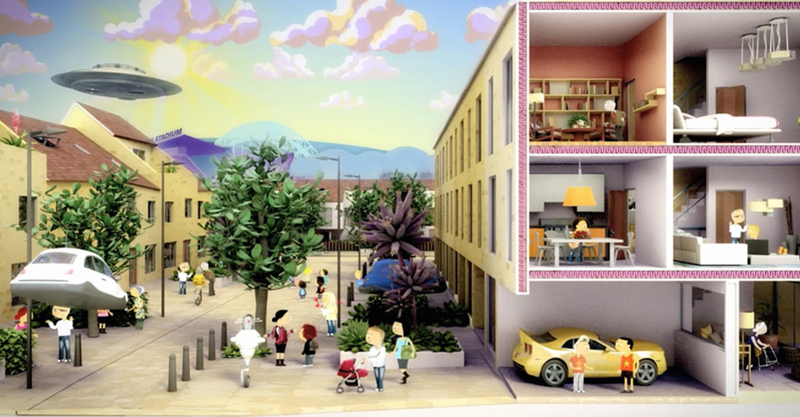 Pop-up, comics and video-game style to introduce a new urban development in Gateshead. Squint/Opera uses its creative and technical skills to introduce a new housing development, and fosters desires about the way of life in the soon-to-be-realized neighborhood. The result is a quite clever short film that transfers pop-up and comics style into moving images, as if we were inside a vintage and stylish video-game. The architectural project is recognizable on the background, but the main focus is on facilities people can take advantage of in the new district. Sociality, sustainability and adaptability are among the key concepts of the master plan: more than uniformity and globalization, customization and diversity are guaranteed thanks to quality of housing and variability of typologies, overall energy efficiency, private vegetable garden, shops with local products. Safe public spaces, shared cars, sport leisures facilities, parks and playgrounds complete the pool of services. A glaze to the future can’t be missed in telling this story, so in the end everything - and especially homes - change and evolve following the desires and the rhythm of life of the inhabitants.